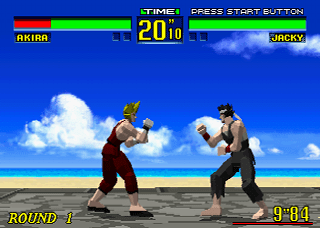 Virtua fighter shares many traits with another Saturn game, Daytona USA, as both a Saturn launch title and a home conversion of a 1993 hit arcade game. The game is noteworthy in the annals of video game history for being the first fully 3D arcade fighting game, which in the early 90’s made it stand out against juggernaut franchises Street Fighter II and Mortal Kombat. The two games were both hampered by Sega’s pushing up the release date of the Saturn console, cutting the development cycle short. That being said, much like Daytona USA, Virtua Fighter deserves a spot on the shelf of any Saturn owner, not only for its historical significance but also because it’s a good game. Virtua Fighter features 8 characters, and the selection screen includes such bizarre “statistics” as job, occupation, and blood type. The game has only two modes – “Arcade” and “Vs.”, both of which are self-explanatory. Probably because it was rushed, the game’s graphics have a low polygon count that do nothing to push the limits of the Saturn and are overly simplistic even for a launch title, but the game has a clean look and runs very smoothly. Sega took full advantage of the CD format with a stellar soundtrack, although the sound effects are nothing to get excited about. The game play appears simple at first, using only three buttons for punch, kick, and block but the game has a plethora of special moves performed using button combos. As is the case with most fighting games, this is where the true depth of the game lies. Not only does Virtua Fighter have a large number of combo moves common to all characters, there are also numerous character-specific ones as well. Aside from the lackluster visuals my only real complaint is that the controls and the game in general can sometimes feel sluggish, which appears to have been part of the game design. The game responds quickly to a simple punch or kick but special moves can be slow to execute, which I think is supposed to play into the strategy of when and when not to use them. Virtua Fighter certainly isn’t the best fighting game ever made, but its simple appearance belies a fairly deep gaming experience. Buy Virtua Fighter on GameGavel or Amazon. Tagged 1995, Fighting, launch, Review, Saturn, sega, Virtua Fighter. Bookmark the permalink.